We are very sorry but this product is NO LONGER AVAILABLE. Our supplier is either out of stock long term, it has been discontinued, or it is not available to us. I discovered this small manufacturer at a trade show. He has the most awesome beach decor oriented fabrics. I convinced him to manufacture cushions for us and here they are. Several minor things to keep in mind. There are two ties in the back of the cushion. I can't guarantee what color the ties will be, they may vary from the photo. Expect to have to trim up some threads when they arrive. Each cushion is hand made so they may not be the exact shape as each other. Expect them to be close but not EXACT. Expect the placement of the chair cushion pattern to be close to, but not necessarily exactly like picture shown and to each other as they are hand made. The fabric is the same, pattern placement will vary. Choose from 2 sizes. Photo shown is the smaller size. Small Size Cushion Approximately 14" deep by 17" wide. Large Size Cushion Approximately 17" deep by 19" wide. SHIPPING: 95% of our orders ship within 2-4 WEEKS plus a few days transit time. These products are made to order. Thank you for your patience. Approximately 3 1/2 inches thick. 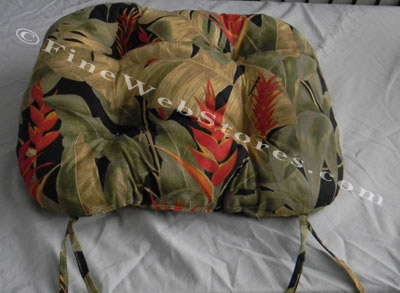 The cushion padding is packed nicely with 100% polyester fiber. Several tack and jump stitches on chair pad to keep fiber filling in place.